Clark Township > COMMUNITY > About Clark Twp. In the 17th century, European explorers and fur traders sojourned through this wooded and protected waterway of 36 islands and homeland of the Anishinaabe called Les Cheneaux, by the French explorers, an expression referring to "The Channels." Today, sheltered bays along the 12-mile coastland, unique and colorful boat houses, sandy beaches, woodland trails, and natural beauty of the area welcome contemporary explorers and offer four seasons of fun, rest, and relaxation for vacationers and residents alike. 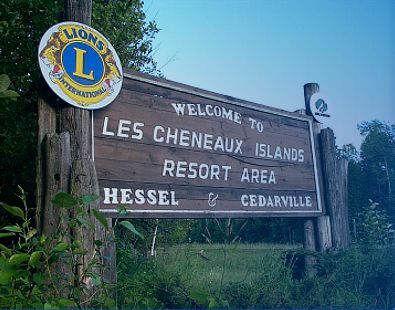 Two thousand people call Clark Township home, living in the villages of Cedarville, Hessel, or residing within the Les Cheneaux Islands. The Les Cheneaux Islands was designated by the Nature Conservancy as one of the "Last Great Places on earth" for its unique and virtually pristine environment and ecology. Rare rock formations, a 36-island archipelago, geologic formation along the Niagara escarpment, a variety of coniferous and hardwood trees, bouquets of wildflowers, and home to a variety of wildlife from migratory birds to game fishes, deer, bear, wolves and inhabit the woods, waters and islands. And then, there's the people and their community. Home to the first Great Lakes franchise of the Chris Craft wooden boat and nationally renowned Antique Wooden Boat Show, Les Cheneaux is also home to the Great Lakes Boat Building School, one of four in the country; the Les Cheneaux Culinary School, which focuses on ‘farm to table’ culinary training to develop chefs into culinary leaders and features a regional, organic cuisine; two museums--Historical and Maritime--which tell the stories of the spirit and people of the Islands; artesian crafts, paintings, pottery and more at the Old Shell Art Gallery; the Les Cheneaux Distillers makers of their own vodka, gin, whiskey and craft beers; the Kewadin casino hosted by the Sault Tribe of Chippewa Indians welcomes those who enjoy 'inside gaming'; and a host of festivals, organizations and groups that promote recreational activities, care and protection of the environment, and celebrate all the seasons in Michigan's Upper Peninsula. They reflect the ingrained Anishinaabe spirit of "people who cannot be separated from the land and its cycle of seasons." The community also knows the importance and value of its own backyard. Preserving and protecting the coast and shore, insuring good habitat for wildlife, promoting ethical use of the lands, and close monitoring of its sewer and lagoon system are interwoven among governmental, recreational, and community-wide interests and activities. Clean lake water promotes the sport fishery which supports the tourism industry. Healthy wildlife habitat fosters adequate duck and deer hunting which supports our cottages, motels, and restaurants. Managed forests and trails promote hiking and winter activities. That ecological consciousness is fostered and developed in the school system as well as students conduct water sampling activities that provide specific data to the State. Classes and programs on gun, boating and snowmobiling safety, essential to activities and way of life in the area, are integrated into the school's activities. Clark Township is also home to the international Carmeuse Lime and Stone, Inc., which has more than 95 facilities through 15 countries around the world, and the largest employer in Clark Township. And the community knows how to throw a good party. The Antique Wooden Boat Show established in 1976 hosts almost 8,000 people on the second Saturday in August. The annual Snowsfest winter festival helps break up cabin fevers in February. The Aldo Leopold Festival brings visitors from across the mid-west in late May to learn about the wonders of the wilderness and beauty of Les Cheneaux. The Ensign Class Yacht races sail colorfully through the bays in summer. The 4th of July celebrates our national heritage and brings families and friends together. Art in the Park and the Artisan's Craft show displays the skill and beauty of our local painters, potters, musicians and more. Islands Wildlife hosts a delicious dinner and auction to benefit wildlife habitat protection. The Sault Tribe of Chippewa Indians host their annual Gathering of Eagles Pow Wow in August featuring their traditional drum ceremonies and colorful dancing. And then the Old Timer's Softball game takes the labor out of Labor Day with laughs, hot dogs and beer, and plenty of sore muscles. The Les Cheneaux Islands stretch from west of Hessel to east of Cedarville along the Pure Michigan M-134 Byway nestled on the northern Lake Huron shoreline. Quietly noted on maps of Jesuit explorers in the 1600s, it retains a quiet presence and welcome sanctuary for generations of families and visitors to remember the simpler joys and seasons of life. From eye-opening sunrises to serene sunsets, from autumn's palette to Aurora Borealis' splash of celestial colors, from exquisite dining to good ol' home cooking, from wooden boats, sailboats and kayaks to snowmobiles and skis Clark Township and the Les Cheneaux Islands welcome you all season long.